OPEN HABITAT RESTORED. The 1,000-acre Moquah Barrens after a recent prescribed fire to remove encroaching trees and restore open habitat. This portion of the project area is designated a weed free zone. The pine barren ecosystem was once widespread throughout the landscape of northwestern Wisconsin. Today, only about one percent of the original 2.3 million acres of this rare ecosystem remains. “The mosaic of forests and open prairies characterizing the barrens supports habitat for plants and wildlife, some of which are now considered rare in Wisconsin because of habitat loss and fragmentation, changes in land use, and fire suppression,” explains Matt Bushman, District Botanist for the Washburn Ranger District of the Chequamegon-Nicolet National Forest. 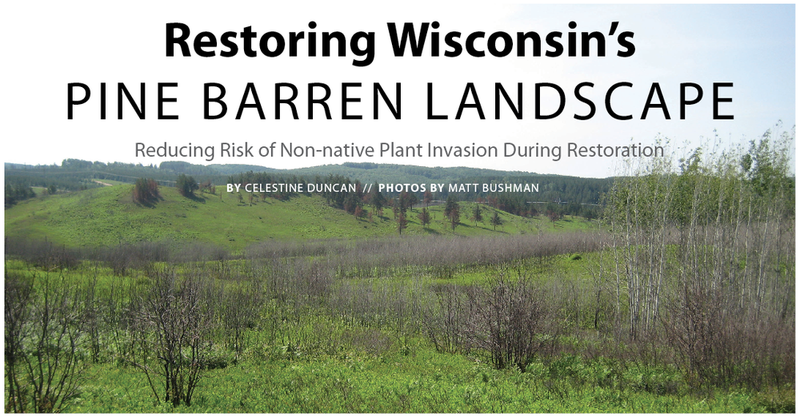 Bushman is helping facilitate the Northwest Sands Pine Barren Restoration Project that encompasses about 23,000 acres in northwest Wisconsin. The creation and maintenance of the pine barrens landscape on the Washburn Ranger District has been ongoing since the 1960s. 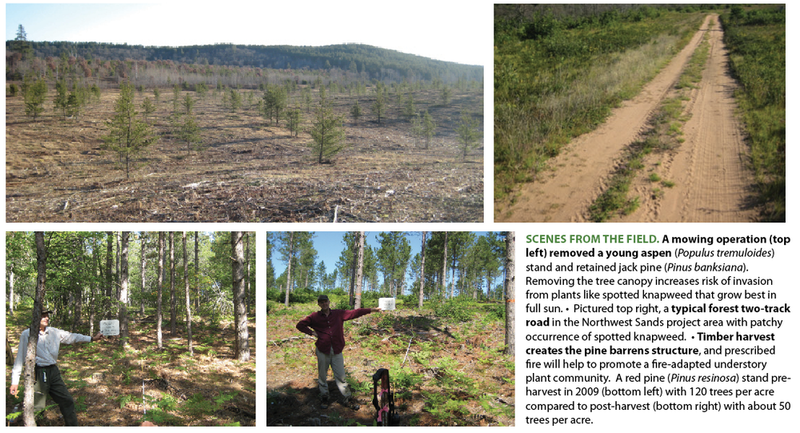 Although about 7,000 acres were in some phase of restoration prior to 2009, the Northwest Sands project greatly expanded the Forest Service mission of reestablishing the barrens ecosystem. Disturbance caused by timber harvest, building temporary roads, burning, and mechanical site treatment are common throughout much of the Northwest Sands project area. These actions can increase the risk of spreading invasive plants to non-infested sites. Removing the tree canopy during restoration activities also increases light availability and provides more suitable habitat for invasive plants that grow best in full sun. “We recognized that this restoration project would increase the risk for spread and establishment of non-native plants so we conducted pre-treatment surveys and developed a strategy to mitigate the impacts,” explains Bushman. The survey showed about 45 acres infested with spotted knapweed (Centaurea stoebe), bull thistle (Cirsium vulgare), leafy spurge (Euphorbia esula) and several other non-native plants within the project area (Table 1). Brown knapweed (Centaurea jacea) is a perennial plant that grows 1 to 3 feet tall and invades dry fields, roadsides and meadows. Basal leaves are oblanceolate to elliptic and 2 to 10 inches long. Leaves become smaller and more linear as they move up the stem. The flower heads are found at the tips of branches and have dark brown fringed bracts. Flowering occurs from June to October, when rose to purple colored flowers appear in 1 to 1.25 inch wide, solitary heads. The plant reproduces from seeds and from the woody root crown. Brown knapweed is native to Europe, and is an aggressive invader, preferring moister, cooler conditions than other knapweed species. It can tolerate partial shade. To minimize the high risk of introduction and spread of weeds, guidelines and design features such as location of log landings, clean sources of gravel for road fill, and language in contracts regarding equipment cleaning were implemented. Also, herbicide treatments on invasive plants were conducted within the project area prior to, during and following logging and mechanical treatment. Local weed control efforts by the Northwood’s Cooperative Weed Management Area and Forest-wide weed treatment also reduced the size and scope of infestations within and adjacent to the project area, reducing the potential for movement into the site. “We initially sprayed spotted knapweed in the Northwest Sands project area with Round-up*. After the first year of treatment, we switched to Transline® at 2/3 pint per acre based on recommendations from other applicators and on-the-ground observations. Although Transline gave good selective control of spotted knapweed, we currently apply Milestone® at 5 to 7 fluid ounces per acre (fl oz/A) because of the sandy soils and more consistent spotted knapweed control,” explains Bushman. Woody invasive plants in forested sites include Siberian pea shrub (Caragana arborescens) and autumn olive (Elaeagnus umbellata), which were planted in the project area 20 to 40 years ago to provide food for wildlife. Forest Service weed crews have been controlling these plants by cutting and uprooting. “Both woody plants are a high priority for treatment since infestations are small and eradication is still possible,” explains Bushman. The biggest challenge for project managers is locating and treating newly established infestations of spotted knapweed and other invasive plants. Inventorying the Northwest Sands project area in addition to the entire Washburn District is a difficult challenge, and land managers are constantly finding new populations of non-native invasive plants. Fortunately, most infestations in the area are along roadways where they are visible and relatively easy to control. The Northwest Sands restoration project is a high priority for managing invasive plants within the Chequamegon-Nicolet Forest. “Portions of the project area are designated weed-free zones, most infestations are easily accessible, and there are few infested acres so we can protect a large landscape from weed invasion at a relatively low cost,” says Bushman. Most of the Chequamegon-Nicolet National Forest has dense tree canopy cover and is not as susceptible to invasion by spotted knapweed and leafy spurge. By focusing treatments within grasslands and other open habitats the Forest Service is able to utilize slim resources more effectively. The Washburn Ranger District is committed to restoring the vegetation structure and composition of a functioning pine barrens ecosystem in northwest Wisconsin. Management actions such as timber harvest, fire, and mechanical treatment are shifting the plant community toward the barrens landscape. However, long-term use of prescribed fire and diligent control of invasive plants will be necessary to maintain the ecosystem. *Trademark of Monsanto Technology LLC. ®™Trademark of The Dow Chemical Company (“Dow”) or an affiliated company of Dow. Milestone is not registered for sale or use in all states. Contact your state pesticide regulatory agency to determine if a product is registered for sale or use in your state. Label precautions apply to forage treated with Milestone and to manure from animals that have consumed treated forage within the last three days. Consult the label for full details. State restrictions on the sale and use of Transline apply. Consult the label before purchase or use for full details. Always read and follow label directions. Active ingredients for herbicide products mentioned in this article: Milestone (aminopyralid), Transline (clopyralid), Round-up (glyphosate).